Welcome to 6068 E Hemmi Lane. The moment you cross the threshold you will know this is home! Just built in 2009, this 4500+ sq ft 4 plus bedroom home has spaces for everyone. Inside: large open kitchen with all the upgrades, eating space with a gas fireplace, huge laundry room, main floor master, large bonus room and 2 more bedrooms upstairs. Very private pool space/w change room- and covered patio. What a place to entertain! On 3 over acres - one of the 2 huge shops has a guest area too. Stunning 4 bedroom, 2.25 bath home in highly desirable Eagleridge w/gorgeous Lake Whatcom & sunset views. Situated in a quiet cul-de-sac on a sunny & beautifully landscaped lot with fruit trees. Spacious main level includes enviable master suite & bath w/custom, designer finishes, vaulted dining & living area w/fireplace. Large composite deck is perfect for entertaining. 3 lower level bedrooms, family room & wet bar, could be in-law suite. Public beach access & Agate Bay Preserve are close by. Samish Heights new construction! Bay and island views from this brand new 4 bedroom 3 bathroom home tucked away on Bellingham's South Side. This 3,663 +/- s.f. JWR designed home offers quartz counter tops throughout, hardwood floors, formal dining, main floor den, gourmet kitchen w/custom cabinets, large island, double ovens & walk-in pantry and master suite w/stunning views, private deck and spa like bathroom with heated floors, soaking tub, dual vanities & tile shower. Four units, all exquisitely renovated, move-in ready, sitting on 1.5 acres of pristine wooded land in sought after Geneva neighborhood. Plenty of parking. Large landscaped yard. Romantic bridge crossing the creek running through the property. Accessory building w/office, workshop, garage & extra storage shed behind. One block from Lake Whatcom Park(swimming + Kayaking.) In the Geneva School District, the most sought after school district in Whatcom county. Highly desirable neighborhood. Experience the NW lifestyle in luxury on Campbell Lake in the San Juan Islands. 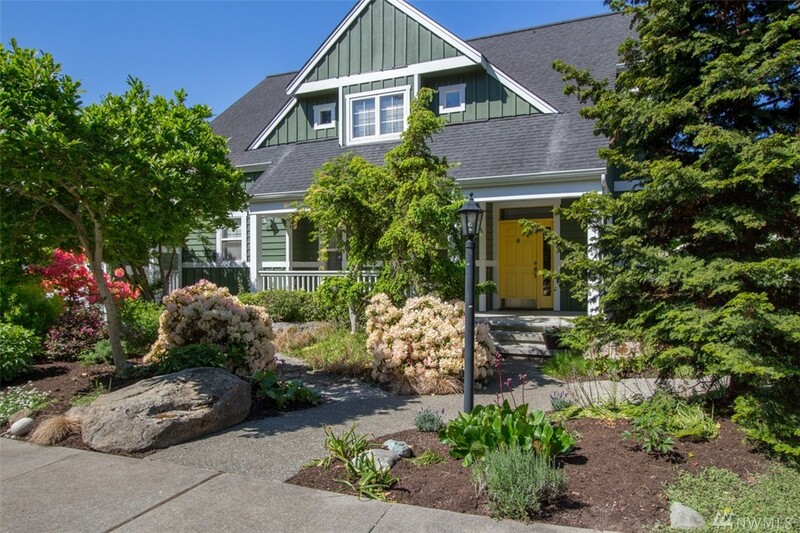 Situated at the heart of Fidalgo Island, this property offers features that surpass expectations with outstanding quality. The 9 ac. estate provides waterfront lake access, helicopter pad, sports facility, fishing pond, vault, and enough space for a car collector. Additional 2 bed 2 bath luxury home on property for guests or staff. Enjoy sweeping hilltop views by the fire. Video and 3-D Tour available. Beautiful 3,000 + sqft Log Home on 3.32 Acres Just Outside of Town! Complete Viking appliance package, maple floors & granite counter tops in a stunning open kitchen. Gorgeous slate floors, gas fireplace. Laundry room with built in refrigerator/freezer, oven & wine cooler. 95% efficient furnace, standard gravity septic/ 20ft well. 36x60 shop with office/bath & kitchen + 1 car carport, tank less hot water in shop as well. 3,500 Feet of new Horse Fencing. 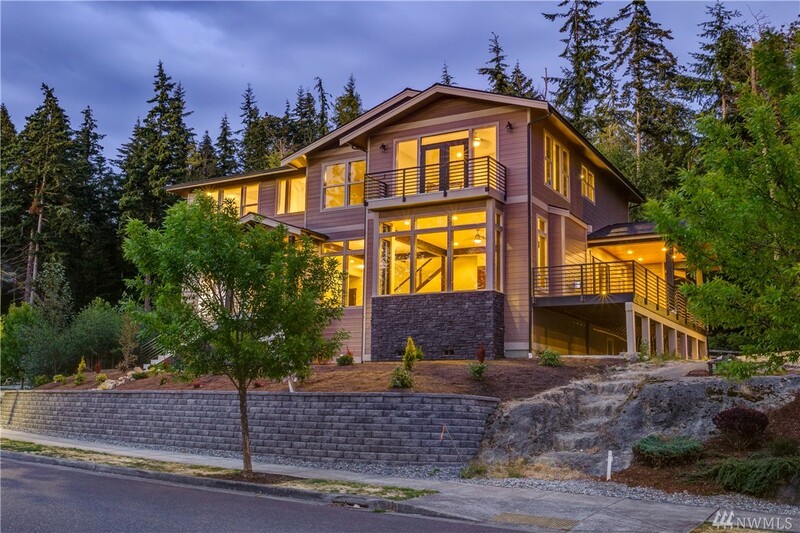 Very few spectacular homes on Bainbridge offer a 360 view�from Mt Rainier to Mt Baker, the Cascades to the Olympics! This is one of them! Absolutely beautiful from sunrise to sunset! Every room experiences a water view. Extraordinary home designed by Bob Hoshide with thoughts of creating the perfect dwelling for everyday living and entertaining�including 2000sqft. of decks. 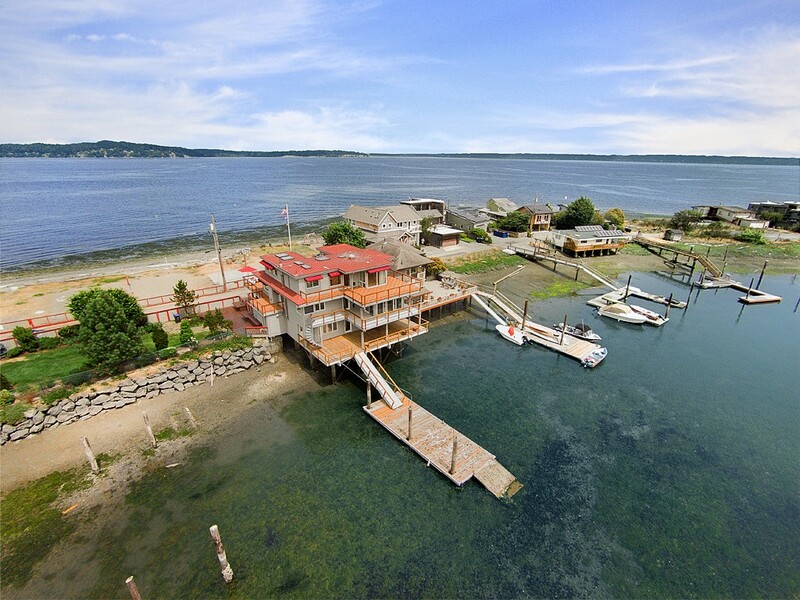 Over 300ft of waterfront from bay to Puget sound side, a sandy volleyball court, and opportunity for future development. Craftsman charm, casual comfort & functional space, this home is a soothing retreat from life�s hustle and bustle. Relax & gather in open living areas arranged around an inviting island-style gourmet kitchen. Main floor master, 3 bedrooms up, huge lower level w/family room, bonus & guest room provides extra flex space. Step through French doors for BBQ on private garden patio. Nestled in Hillandale, a coveted in-town enclave with grassy open space, winner of a national award for best community. Peace & privacy above it all, just minutes to the treasures of South End living; serene Gazzam Park trails, Point White Pier & vibrant amenities of Pleasant Beach Village/Lynwood Center. Bright & spacious 3458 sq. ft. 4 bed/2.5 bath home lives large w/room for all, an ideal mix of casual & formal living spaces. Oversized 2 car garage with 220v outlet for electric car. Updated w/new carpeting, fresh paint, new roof & refinished bathrooms. Sunny gardening & play spaces galore. Welcome home! Welcome to Green Gables, a quality, Custom Green built Craftsman home situated on a shy 2.5 ACR. Fenced pastures, barn and outbuildings for farm animals or hobbies are all yours! The attention to detail & Craftsmanship throughout is something rarely seen these days. UV Furnace, water filtration system for your healthy well being as well as a Gorgeous River rock fireplace,Travertine & Wood floors and soaring ceilings. Enjoy Beautiful outdoor living spaces and gardens. A 140' waterfront home with dock, boathouse and stunning, serene views of Manzanita Bay, this estate has much to offer! Professionally landscaped for privacy and sophistication. Quality construction and attention to detail: gorgeous designer touches are apparent throughout! Tall ceilings, large dining room, beautiful kitchen, master on the main level. Graciously entertain guests or enjoy the sun on one of the many decks and patios. Battle Point Park and The Grand Forest close by...Island living! Magnificent estate in Port Madison with 217� of low-bank waterfront. The home enjoys one of the longest deepwater docks on the island, with a boat lift, too! Meander through over an acre of beautiful, mature and professionally landscaped gardens. This incredible home was designed by Roger Katz and built by Fairbank Construction. The property faces west for all day sun. There�s a pool, wine cellar, movie theater, and finishing touches that are quite noteworthy. Island living at its finest! Inspired by Marie Antoinette's retreat in Versailles, this sophisticated manor reflects magical merging of inspiration & period architecture. The unsurpassed craftsmanship of this luxurious custom estate welcomes you w/gleaming hardwoods, soaring ceilings, rotunda w/grand circular staircase. Epicurean kitchen w/Carrera marble, LaCanche range, Waterworks & Herbeau fixtures, butler's pantry & chef's office. Master wing w/grand bath. Wine room, au pair qtrs, theater room, library, Sonos throughout. Builder investor opportunity to develop shy to 2 acres!! Zoned Residential Low Density w/ possibilities to build multiple homes. Sellers will sell tax parcels individually; Parcel # 8564800050 equals 0.84 acre and Parcel # 8564800060 equals 1.1 acres. Buyer's to verify with City of North Bend the number of homes property will yield. Parcels are located in Tanner; area of new home construction. 62+ acres in desirable Dungeness area. 12 contiguous parcels allow for residential development, or a large farm or estate. Access from Lotzgesell and Hogback Road. One old farm house and well on the property. Seasonal duck pond. Cline irrigation. 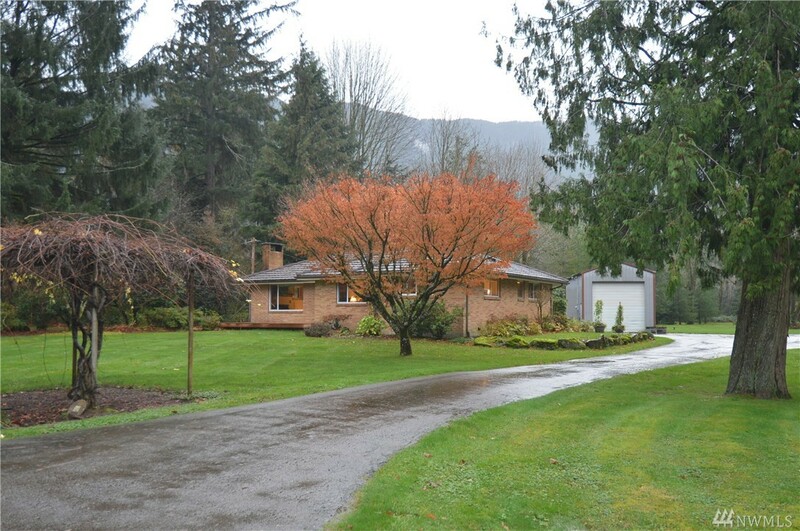 John Buchan custom home in coveted Cedar Cove community. Built with great attention to detail by the current owner this lovely home flows with natural light and spacious rooms. 4 bedrooms, 3.5 baths, lovely upgrades, formal and informal rooms plus perfect entertainment spaces. Oversized lot awaits your personal touch, let your imagination soar and discover the fun of gardening. Seller is offering a 10,000 credit to make your garden. Seller is very motivated, go look and fall in love. The epitome of �home� with 5 bedrooms, this is the best value on MI. Located in the coveted East Seattle neighborhood on the island's northwest corner, easy access to I90, it's central to everything in Seattle/Eastside. A small kids� play park sits across the street, and a 4-block stroll through MI�s friendliest neighborhood down to 5 public lakefront beach parks. Recently cosmetically updated, AC, heated floors, new paint, new carpet, laundry on both levels -- it�s turn key! Gardeners/equestrian dream! 4 acres of lush, flat pasture on the river with fully fenced garden space and mature perennials and rhododendrons for fabulous color from early spring to frost. Very private lot includes a tastefully remodeled home, towering hardwoods, easy access to hiking and biking trails and walking distance to all North Bend has to offer. This peaceful retreat boasts incredible views of Mt. Si and Rattlesnake Ridge. Plenty of room for pets and toys!